Karl Krieger, Vice Chairman of the Department of Cardiothoracic Surgery at NewYork Presbyterian-Weill Cornell Medical Center, Ramona and Mario Singer and Alex McCord and Simon Van Kempen from the Real Housewives of New York City. 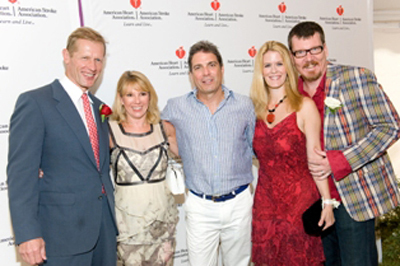 This year, the Heart Ball will honor Todd K. Rosengart, MD. Professor and Chairman, Dept. of Surgery, Chief, Div. of Cardiothoracic Surgery, SUNY Stony Brook School of Medicine and Ambassador Charles A. Gargano Former Chair and CEO, Empire State Development, V. Chair Port Authority NY & NJ. Star Jones will receive the “Humanitarian with Heart” award. will serve as Emcee for the event and Clinton Kelly, co-host of TLC’s What Not To Wear will be this years’ Auctioneer. This year’s event Chair will be Robert McBride Park Strategies, LLC. The Ball will take place from 6:00 p.m. to 11:00 p.m. Tickets are $500. For more information, sponsorship opportunities or to purchase tickets, please contact Barbara Poliwoda at (631) 734-2804 or visit www.heart.org/suffolkcountynyheartball. The American Heart Association would like to thank local media sponsors, Long Island Pulse Magazine, Dan’s Papers, Hamptons & Gotham Magazine.